PavisPassion: Veg Fried Rice | Chinese Fried Rice. 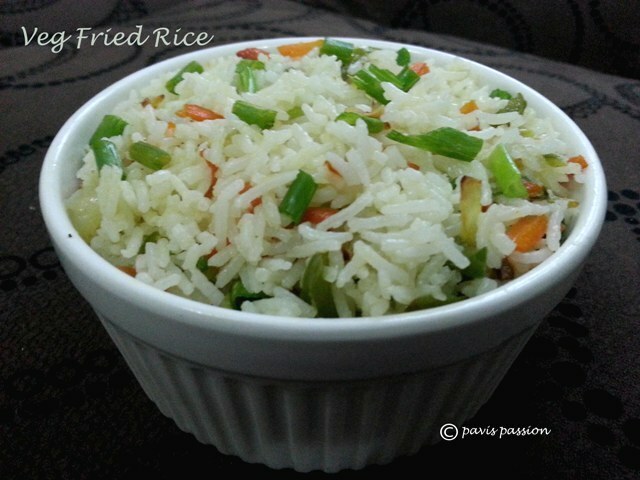 Fried rice is good recipe which is so easy and highly appreciated whenever i do for my friends and family. Before i tasted the fried rice at hotel its contains more oil and stomach was bloated every time... so i hate to try the fried rice..One of our friends bought me fried rice from a Chinese restaurant it so favourable and there is no burden in stomach, it digested easily.. they used pepper as a spice for the rice. now i became a big fan of fried rice ...i tried this fried rice every time it came out good ..
1. Chop the vegetables Carrot, Capsicum,Cabbage and white part Spring onion into thin small strips. 2. Cook the basmati rice in a pressure cooker with 1tspn of Ghee or Olive oil ,and water as 1:2 for 1 whistle..
3. Heat 1 tbsp of Olive oil and saute Chopped carrot first for 1 minute and then add Cabbage, White part Spring onion and Capsicum and fry until cooked or crunchy if u like. 4. Mix Generously the sauteed veggies,Pepper, Soy Sauce, to the Rice. 5. Garnish it with green part of Spring onion and mix it well. 6. Serve hot with any thick Gravy like Paneer butter masala or Gobi Manchurian.